Covering a large area at the confluence of the Prasak and Chao Phraya rivers, Wat Phanan Choeng boasts one of the largest, most beautiful and most highly revered Buddha images in Ayutthaya. The often-crowded complex also stands as a centre of a Chinese community that predates the city. 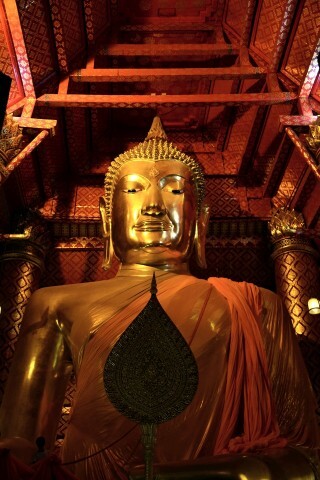 It’s agreed that Wat Phanan Choeng was established at least 25 years prior to the 1350 founding of Ayutthaya. Chinese refugees fleeing Song Dynasty persecution are thought to have first settled the surrounding area in the late 13th century. A large Chinese cemetery is located across the street from the temple, which still displays a great deal of Chinese influence blending with Thai artistry. The highlight is a 19-metre-tall and 14-metre-wide Buddha image seated in the Subduing Mara posture in a richly decorated wihaan. Sculpted in 1325 from a mix of brick and plaster and later gilded, it displays an early Ayutthaya style similar to the Phra Mongkhon Bophit image, but on a grander scale. We arrived to find merit-makers tossing long strips of ochre cloth up to a couple of men who placed them on the Buddha’s lap. There’s not much free space within the wihaan and you may need to wait outside the only door before you can squeeze inside. The long corridor leading to the principle Buddha image, which goes by a few different names but is usually referred to as Luang Por Toh, is studded with Chinese lanterns, banners, a Kuan Yin image and at least two dozen ways to part with your money by donating to the construction of this or that section of the temple. Judging by its gaudy outer appearance, we reckon that Wat Phanan Choeng rakes in the dough. It’s also worth checking out a pair of secondary halls standing side-by-side towards the front of the complex. The ordination hall features several Sukhothai-era Buddha images, including a small one made of solid gold, along with a striking mural depicting the Buddha’s enlightenment in the Central Thai style. Identical to the ordination hall in size, the neighbouring wihaan boasts elaborate Chinese decor, including gold-tinted murals and several Chinese-style Buddha images placed among a large shelf of Chinese statuary. A separate Chinese-style building contains a shrine dedicated to Phra Mae Soi Dok Mak, a local goddess. Otherwise, an ugly concrete car park rimmed by vendors selling roti sai mai and other local foods covers the complex. From here you might continue to Baan Hollanda and the Japanese Village, both located within walking distance to the south. Wat Phanan Choeng is located off Route 3477, a few km west of Wat Yai Chai Mongkhon. It’s often included on boat tours that also hit Wat Chaiwatthanaram and Wat Phutthaisawan.